Historians who argue otherwise overlook the appalling conditions on the ground. 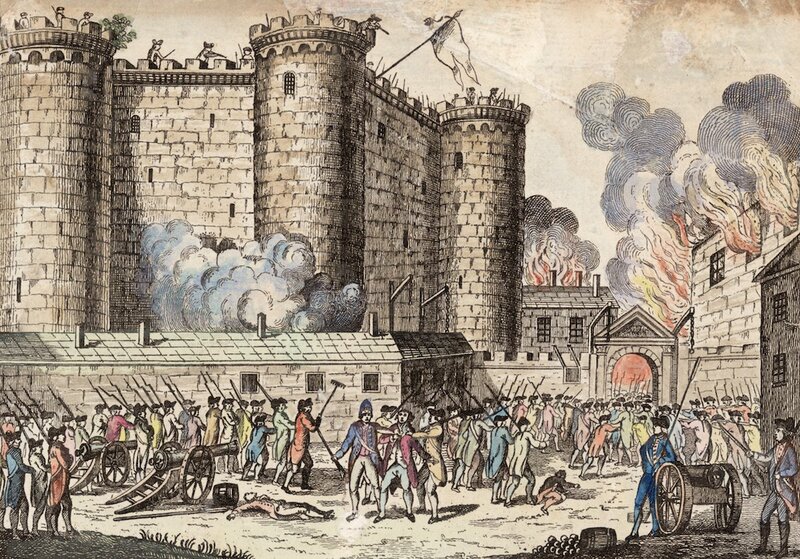 Citizens of Paris, headed by the National Guards, storm the Bastille prison. Confusion and chaos reigned everywhere . . . The controller-general of finances admitted that it was impossible for him to draw up a regular budget owing to the absence of a clearly defined financial year, the vast number of different accounts . . . One minister would protect the philosophes while another was persecuting them. Jealousies and intrigues were rife. . . The interests of the public were no longer protected. The divine right of absolutism served as an excuse for every kind of waste, arbitrary procedure, and abuse. In describing French society of the 1780s, it is customary to follow the divisions made in the Estates-General — nobility, clergy, and Third Estate. This has a certain logic, provided we keep in mind that these “orders” were not compact and homogeneous blocs, as the train of events would very shortly demonstrate. The Third Estate made up the great majority of the 28 million inhabitants of France. “What is the Third Estate? Everything,” Sieyès wrote in January 1789. But this celebrated dictum should not lead us to forget that “Third” was not a name but a number, and that this “everything” was made up of very different groups that would each play their part in the course of the revolution. Among these groups, the number of Louis XVI’s subjects that lived on the land is estimated at 23 million. In the years leading up to the revolution, however, the forms of landed property and cultivation underwent significant change. For centuries, the lord’s seigneurie had been made up of two parts: the réserve, land over which the lord enjoyed exclusive rights, and the censive, where rights were divided between lord and peasants; the latter paid a cens to the lord — who was most often noble, but could also be ecclesiastical or a commoner — but they could not be expropriated, and transmitted their tenure to their heirs. Alongside the seigneuries were communal lands that were the collective property of the village community: woods, pastures, and cultivated fields whose products were divided (unequally) among its members. This “miserable system” prevailed in the poorest regions, such as Brittany, Lorraine, and the center and south of the country. Even among the farmers, there were great differences of condition: the exploiters of large cereal farms in the Paris basin and the north had nothing in common with the small farmers of the bocage or the mountain regions. Those who worked the land were not always tenants. Over the course of the century, many peasants became owners of land, and it is estimated that before the revolution they possessed a third of the total cultivable area — a proportion that varied according to the region, being low in the rich wheat-growing lands and high in those provinces where cultivation was hardest. At the top of the ladder a prosperous peasantry began to form; these grew rich with the rise in commodity prices, as their production gave them a surplus to sell over and above family subsistence. This stratum of well-to-do peasants was not very large: most peasant proprietors possessed a small parcel that barely allowed them to lead a self-sufficient existence. They were often obliged to seek additional income from rural industry, or to go and work elsewhere as seasonal laborers. There was not one action in rural life that did not require the peasants to pay a ransom. I shall simply cite with no further commentary: the right of assise over animals used for ploughing, the right of seigniorial ferries for crossing rivers, the right of leide that was imposed on goods at markets and stalls, the right of seigniorial police on minor roads, the right of fishing in rivers, the right of pontonnage on small watercourses, the right to dig wells and manage ponds. . . the right of garenne, with only the nobles allowed to keep ferrets, the right of colombier which gave the lord’s pigeons the peasant’s grain, the right of fire, fouage and chimney which imposed a kind of building tax on all the village houses, and finally the most hated of all, the exclusive right to hunt . . .
Feudal rights thus extended their clutches over every force of nature, everything that grew, moved, breathed; the rivers with their fish, the fire burning in the oven to bake the peasant’s poor bread mixed with oats and barley, the wind that turned the mill for grinding corn, the wine spurting from the press, the game that emerged from the forests or high pastures to ravage vegetable plots and fields. In the books of grievances for the Estates-General, hatred of seigniorial rights is a constant. At the time when the châteaux were stormed, this was above all, as we shall see, in order to destroy the documents that set down the origin of these rights. Not all rural inhabitants, however, were subject to this. The great mass of those who were neither farmers nor sharecroppers nor proprietors, those who had nothing but their own hands, could only complain of the confiscation of common land, the suppression of free pasturage and the right of gleaning that took away from them the little that remained of the primitive communism of the countryside. These laborers, manouvriers as they were called, migrated to find work on a seasonal basis. When the countryside did not provide this, they sought employment in small rural industries — textiles above all, wool and linen in the north, silk in the south — or else they went to work in the city as builders, hawkers, chimney sweeps or water-carriers. The border is vague between these migrants and the tens of thousands of vagabonds and beggars who tramped the roads throughout the country, accompanied by their women and children. Most historians see the situation in the French countryside as having improved in the course of the eighteenth century, and it is true that this period no longer saw famines of the kind experienced at the end of Louis XV’s reign, when thousands of peasants died of hunger. Yet dearth remained common, and when several bad harvests came in a row, the soudure — between June and October — remained a critical time, with infant mortality in particular reaching horrific levels. The poor seem poor indeed; the children terribly ragged, if possible worse clad than if with no cloaths [sic] at all; as to shoes and stockings they are luxuries. One third of what I have seen of this province seems uncultivated, and nearly all of it in misery. What have kings, and ministers, and parliaments, and states, to answer for their prejudices, seeing millions of hands that would be industrious, idle and starving, through the execrable maxims of despotism, or the equally detestable prejudices of a feudal nobility. Sleep at the Lion d’Or, at Montauban, an abominable hole. Here we have no longer a needless revolution but an inevitable one. Excerpted from A People’s History of the French Revolution, out now from Verso. Eric Hazan is the founder of the publisher La Fabrique and the author of A People's History of the French Revolution.